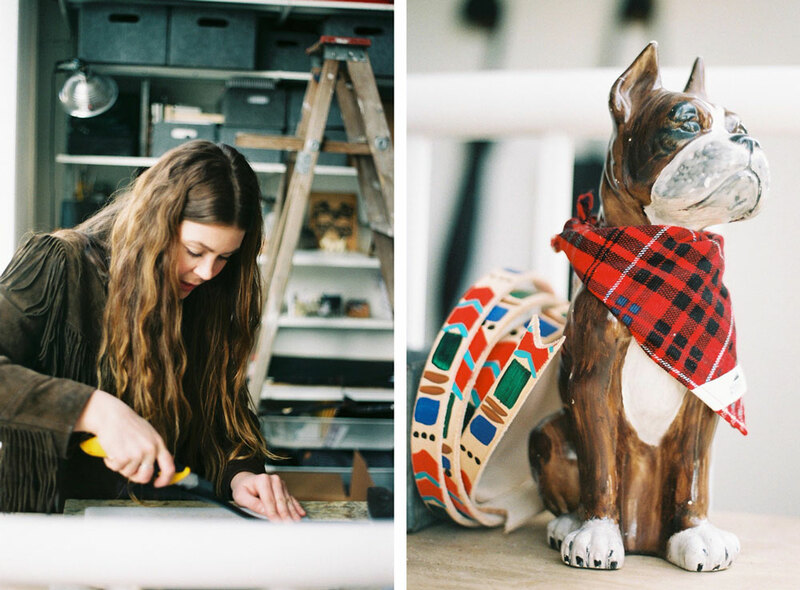 After adopting her dog, Beaumont, Jesse Nightingale decided to start her business, Handsome Mountain, in Vancouver with the idea of offering inspiring and handcrafted pet supplies. 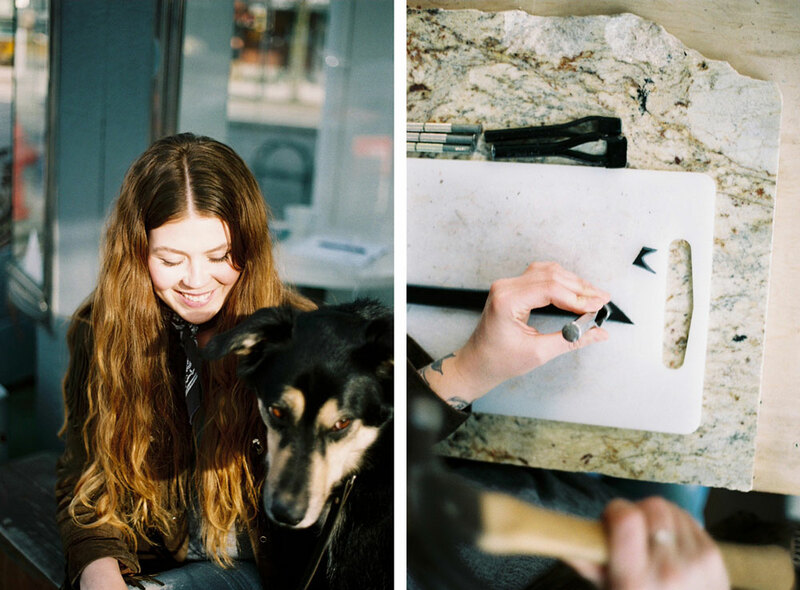 We spoke with Jesse about the manufacturing processes behind her products, the challenges she’s faced since she founded Handsome Mountain, and her two pets, Beaumont and Keilana. Could you introduce yourself and tell us a little bit about your background? My name is Jesse Nightingale and I am originally from Ottawa, Ontario – born and raised – then migrated out to Vancouver, B.C. back in the end of 2009…and never made it back. I come from a background in fashion design, textile arts and business. I love how they have all organically fallen into place. I’m the creator, maker, manager, marketer, and the girl who wears all hats for this business. Could you introduce the two pets we can see in the photos? Of course! They’re the stars here, haha! My dog is Beaumont (aka BeauDog or BeauMan…among a few other nicknames). 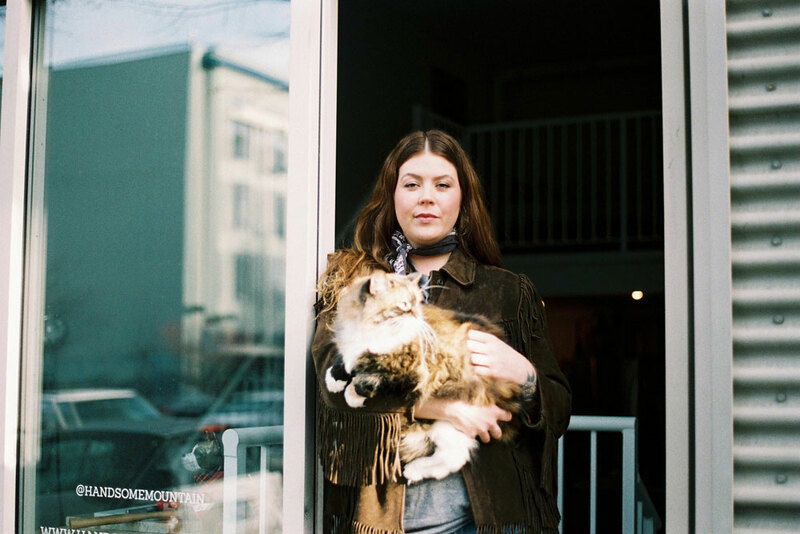 My cat has travelled across Canada with me in a pickup truck on a good 2-week adventure back in 2009. Her name is Keilana – it means “Adored One” in Hawaiian. No reason for the Hawaiian name other than the fact that when I got her I worked at a surf/skate/snow shop back in Kanata, ON. and was obsessed with surf culture, and always dreamed of getting to Hawaii. I finally made it there last year! Please tell us about what made you start Handsome Mountain. I had recently adopted Beau, and had went out in search of all the basics that you know you’re going to need, aka a dog bed, a leash and a collar. 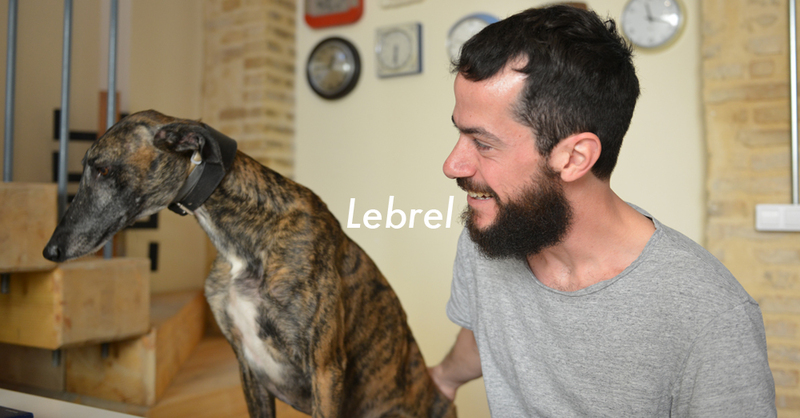 I couldn’t find anything inspiring, cool, or well-made anywhere at the time, and I was pretty bummed that I couldn’t find a basic/classic leather leash or collar. After buying some stuff to tide me over, I came to realize how I had always wanted to try leather work, and thought: why not try to figure out how to make my own leash and collar? So, I set out to find what basic tools and things I would need to make these, and I quickly found myself immersed in the never ending possibilities of the handcraft of leather work. During this time, I had started to dream up logos and business names and it all just kind of fell into place. “Beaumont” means Handsome Mountain in French. I started working with someone to develop a logo, and soon enough I was making dog beds with my hand drawn artwork screen printed on top and all. I had an official business launch party by hosting a pop-up shop here in Vancouver and it was a great success! Since then I think word of mouth, and having such great followers on social media and friends to help spread the love, has really helped grow the brand, even if ‘slowly but surely’. What are some of the main challenges you’ve faced since you started your business? I would have to say the main challenges stem from working on all of this on my own. I sometimes really wished that I had a partner, or someone to bounce ideas around with more often – ‘two minds are better than one’ so they say. Not only that, but everyone has strengths and weaknesses and to manage all areas of a business is a great challenge. This is why I really love collaborating with other artists and makers – it creates more excitement, and keeps me thinking of new ideas. Plus, I love meeting and working with new people! 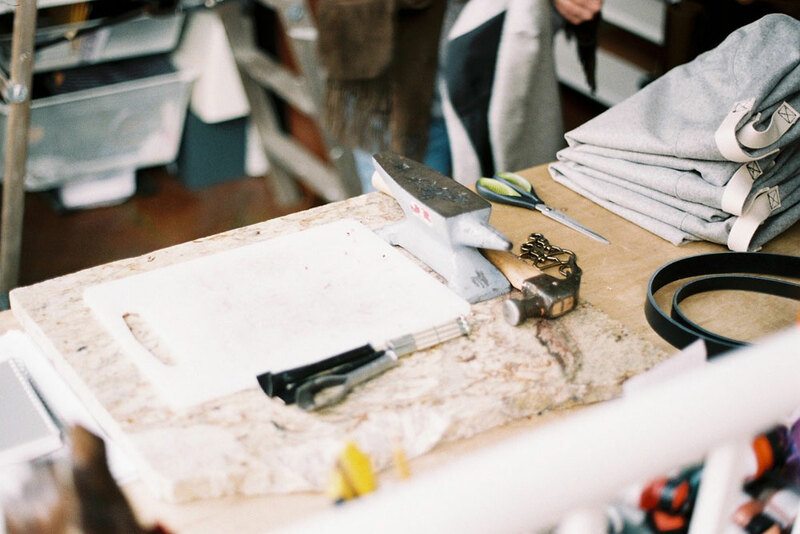 All of your products are handcrafted – could you take us briefly through your design, manufacturing process and the suppliers you work with? Well, I could talk about this for a long time, but I will try to summarize it all for you. Because there are quite a number of different items in the line, that are all made using different materials, each process of design is a little bit different. 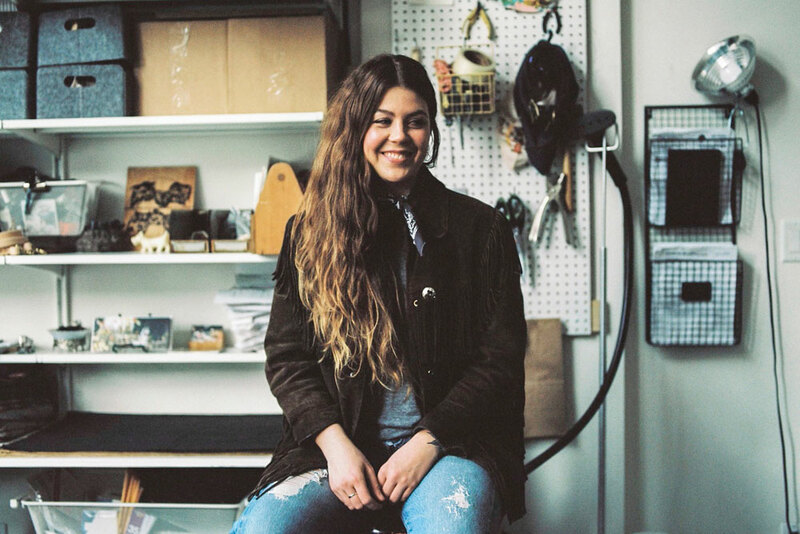 For example, with my leather goods, I’ll often just be stopping by my supplier at Lonsdale Leather and will see a leather quality that will spark an idea for new products, or just add something fun and fresh for the next season. Keeping in mind that anything I’m dreaming up has to be practical and functional. 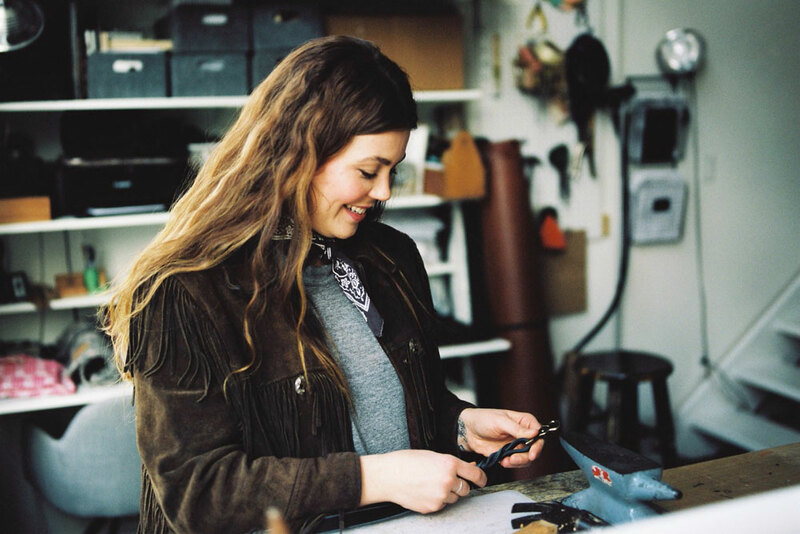 I think my main love is the leather work – there are so many things to experiment with, and so many tools and leather options to choose from. All of my leather goods are made by myself at this time, keeping me very busy. I’d love to have an assistant someday in the future though! My hand-painted leashes and collars are my most time consuming pieces, but I actually love making these. Each one is slightly different from one another and I find it really relaxing. My pet beds and other goods are another story…I designed the patterns first, and had originally made all of my first few pieces on my own sewing machine. 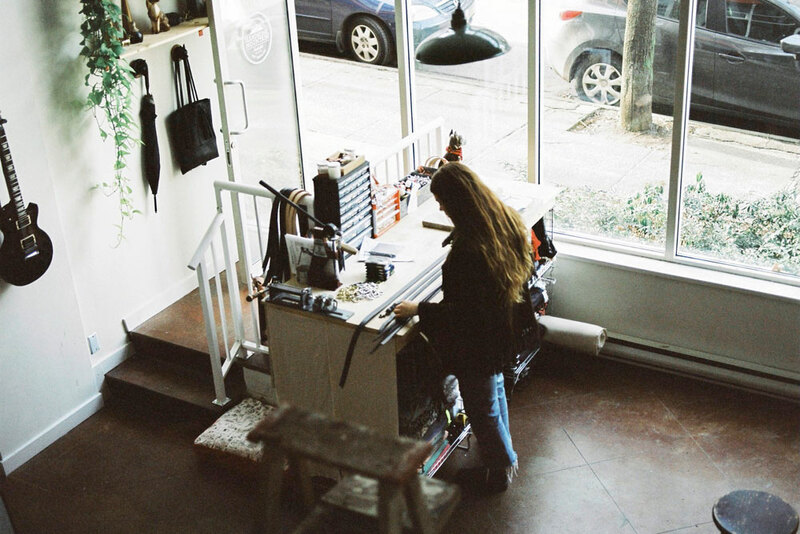 I wanted things to be made with an attention to detail, and with industrial sewing machines to add to the consistency and quality of my goods, so I sought out to find a local factory here in Vancouver. It enabled me to have easy and quick communication, full transparency over the factory, and no importing or exporting of goods and materials. Definitely wanted to keep business in Canada, and I have loved working with all of my local suppliers and businesses. My dog beds and some of my other accessories are made at LOCAL MFG – they are a group of young guys that have noticed the influx of small businesses that need someone to do their manufacturing at low minimums, and to help get their brands started. 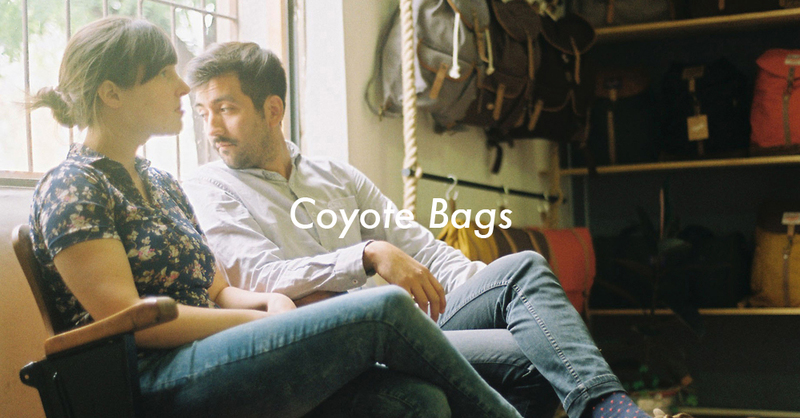 They provide “high quality textile production services for small brands, companies, and personal needs”. I also work with a B.C. company separately for my pillows and stuffing manufacturing. They are out of the city, but only about an hour drive from here out in Pitt Meadows. They’ve been a dream to work with and understand what it is like to ‘start small’. I have my pillows cut and sewn there, and they kindly deliver my pillow orders to me weekly right now, as I don’t have a holding space for a mountain of pillows! Although I wish I did. There are many other people I work with to source trims, marketing materials, packaging etc., so there is a long list of ‘to do’s’ on the schedule at all times. Phew! I think I will end my ‘condensed’ explanation there to save you from the boring stuff. What are your most popular products? Is there any product in particular that you’d like to design in the future? I would have to say that my most popular product has got to be my Pet Beds. I wouldn’t say any colour in particular, although my Stone and Dockside beds have been my top sellers this past season. They garner a lot of attention I think, obviously not because they are a basic shape or anything, but because they are made using durable materials that also look good in one’s home space. I intentionally try to choose materials that can withstand the constant use, and that can wash easily and look amazing in your house at the same time. It’s not the dog you’re selling the bed to, it’s the humans you want to please visually and make your dog the cosiest pet bed all in one! We’re really interested in the community aspect of Handsome Mountain and love your dog ambassadors, could you tell us a little bit more about it? Yes, for sure! I love all of my Brand Ambassadors! They’re all so fun and unique, and all share the same quality and interests in being madly in love with their dogs! Our ultimate goal is to build a strong, collaborative community of people and their pets that can share stories, adventures, and tips n’ tricks with each other along the way that enrich each other’s lives with positivity, well-being, and straight up fun. We want to build closer relationships with each other through social media interaction, fun activities, fundraising opportunities, blogging, writing, events, and sharing all things pet-related. I hope our ambassadors share each other’s passions, interests and adventures through social media, blog posts or events. And also help innovate new products and get their input on new designs, and create excellent platforms for social activities and interactions with Handsome Mountain’s products and ideas. It is also a way to educate each others on products and how to use them, telling others about what they know and love and relating back to Handsome Mountain. 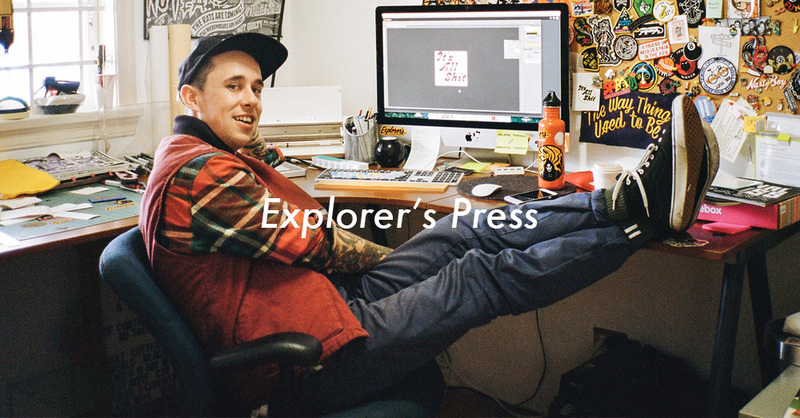 We recently featured another business from Vancouver on our website, Explorer’s Press, and its founder, Brendan, told us about how much nature and exploration influence his designs. These two topics also seem very present in Handsome Mountain – do you think it would be the same way if you were living somewhere else? I read his feature – so great! I know his girlfriend Andy, and also participate and work my second job out of the Ellis building (where they host the Eastside Flea). I definitely think that wilderness, landscape and exploration are a huge part of what inspires me. Any time I discover new places, I get to discover new colours, new textures and create memories that spark ideas, and in turn help me create. B.C. and the Pacific Northwest have a lot to offer for getaways, travel, culture, art, and above all adventuring. I definitely don’t think the brand would have ever existed if I didn’t live here, and if it did, it would most definitely be completely different if I lived in Mexico or something! 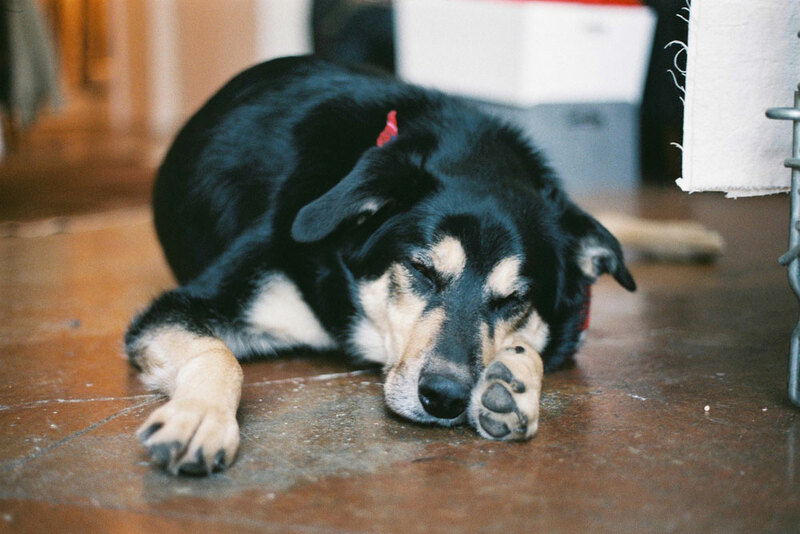 Handsome Mountain supports organisations such as your local BC SPCA, could you tell us about how you work with them? The BC SPCA here does a wonderful job of helping animals in need. They provide adoption, veterinary services, and so many great opportunities to get involved. 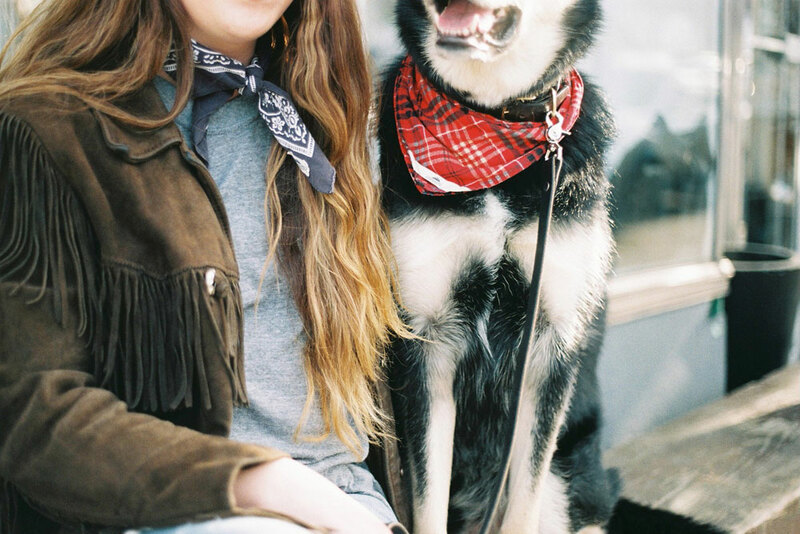 I don’t technically work with them, but Handsome Mountain gives part of the proceeds from the Classic Bandanas to the BC SPCA once a year! I donate $1 from every bandana sold throughout the year. They can use this for many things and I love to help support the animals in need. BeauDog is from the SPCA in Kelowna, BC., and I couldn’t have been happier with their services, and of course for them giving me the best ‘gift’ on the planet (Beau)! 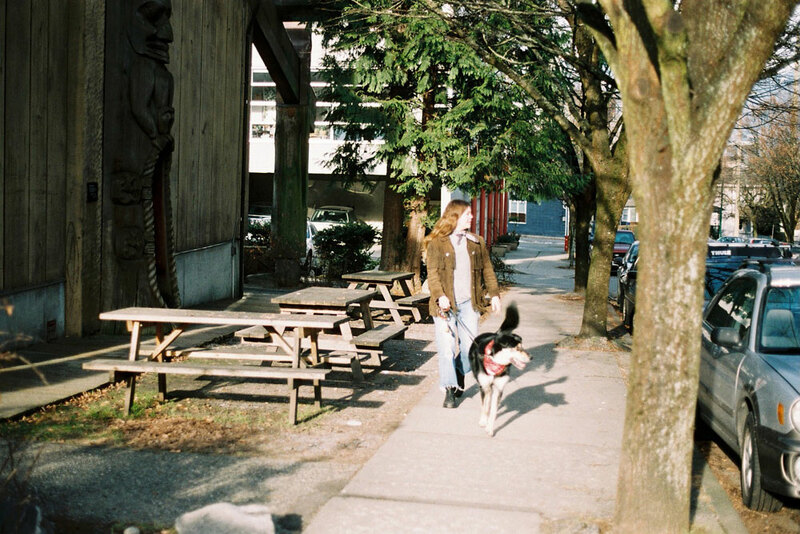 Could you create an itinerary to spend a perfect day in Vancouver with a dog? Heading out on a sunny day in the summer for a bike ride along the seawall towards Kitsilano Dog Beach, bring a blanket and a picnic (but watch out for those dogs that like to beg haha). Watching all of the dogs play and swim in the ocean is pretty entertaining. Stay until sunset is always best, plus it’s a great spot to do some good ol’ people watching – all of the sailboats, paddle boarders, and activities going on. 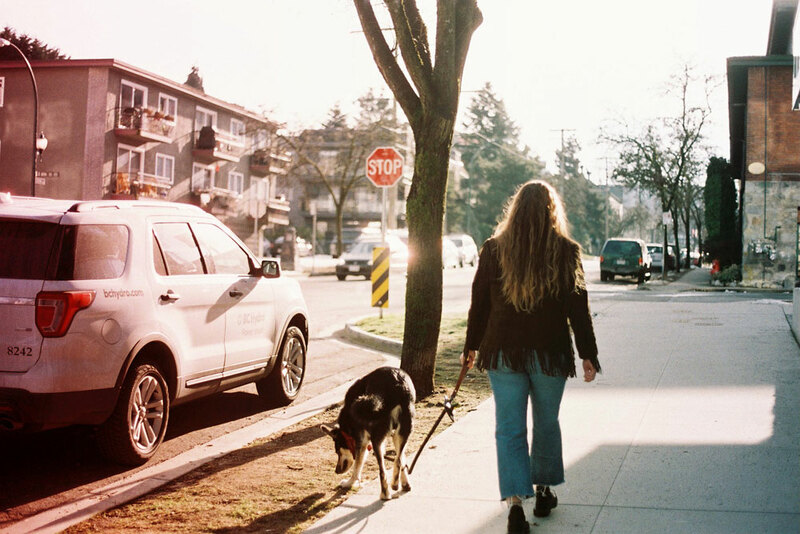 There’s so many other things to do, but I just love the sun and sand in the summer, plus Kitsilano dog beach is where Beau ‘grew up’ and came out of his shell and overcame a lot of his fears after being adopted – so it’s a pretty special place for the both of us. We now live in Mount Pleasant which isn’t too far away, so we don’t make it there as often as we’d like. There’s lots of other goods spots close by! Today we’ve had a very random snowfall, so we went for a stroll up to the famous Dude Chilling Park for a romp in the snow!